Bi-fold doors are a great way to flood an internal space with natural light and are increasingly sought-after by homeowners. Available in PVCu, aluminium and timber options, it can be difficult to know which material is best suited to your project. Aluminium bi-fold doors are some of the most popular on the market and have a number of benefits that are worth considering. Bi-fold doors are seemingly synonymous with contemporary design so if you’re planning on adding a contemporary-style extension to your home, then it would be well worth considering aluminium bi-fold doors.Aluminium options are available with slim sightlines to create a clean, unobtrusive and modern aesthetic and also allow for maximum visible glass to flood the inside space with natural light. 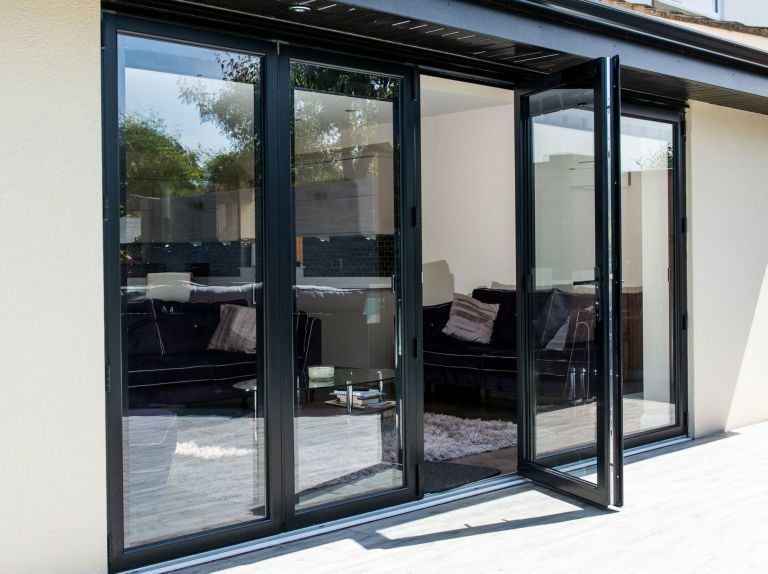 Aluminium bi fold doors can be specified to open inwards or outwards or to slide left or right, so depending on your requirements you can specify an option to best suit your needs. Most can be designed to fit apertures up to 6m in width. While most aluminium doors come in black, white or grey as standard, they are available in over 200 RAL colours to ensure you can specify the bi-fold doors to fit the overall design of your home. Dual colours are also available, offering one colour on the external profile and another on the internal profile to ensure the doors fit with your interior decor scheme as well as the exterior design of your home. Not only are aluminium bi-fold doors easy to operate, they are also available in low threshold options. Low thresholds help to create a seamless transition between indoor and outdoor spaces, but are also useful in homes where accessibility is paramount as they prevent the user from having to step over a threshold when moving between the indoor and outdoor areas. This is also a useful characteristic to consider if you are designing a home for life. As well as being strong and durable, aluminium is also 100% recyclable so it is especially suitable for homes where sustainability and energy efficiency is key. When it comes to the glass, toughened glass is often installed as standard, with self cleaning, solar control or laminated versions also available. Aluminium bi-fold doors are designed to be virtually maintenance-free. An occasional wipe with a damp cloth and lubrication of the hinges and lock is often all that is required. All aluminium bi-fold door pictured are fitted with optional integral blinds.